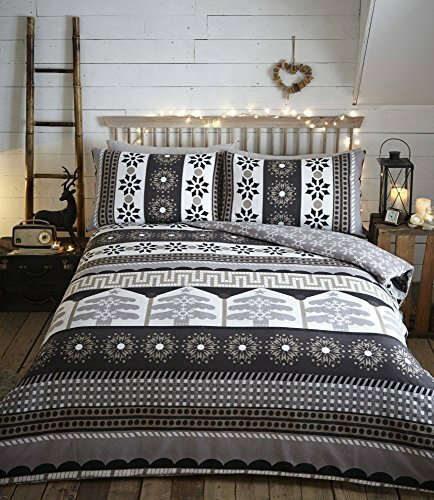 Aspen – Charcoal – Flannelette Duvet Cover Set – Kingsize has the following specifications Create a festive look in your room with this king size duvet cover set in grey, featuring a nordic pattern filled with snowflakes, and Christmas trees. Made from brushed cotton this is the perfect set to keep you warm this winter. Also featuring a reversible design with snowflakes and including two pillowcases. Also available in single, double and super king sizes. Featuring a festive nordic design filled with snowflakes and Christmas trees. Contents: 1 x King Duvet Cover (230x220cm) and 2 x Pillowcase (50x75cm). Also featuring a reverse design filled with snowflakes.